Storytelling + Research = LoiS: Why "LoiS with the big S"? Why "LoiS with the big S"? Fellow storyteller and friend, Mary Garrett, near my hometown of St. Louis, MO once introduced me as "LoiS with the big S", to which I looked at my backside and said mischievously, "I beg your pardon?!?" There's a story there and here it is. Mary knew many people in the storytelling world have seen me sign an email or wear a shirt with a LoiS on it. In the case of emails I love to play with my "big S", adding parenthetical comments. LoiS(imply loves to find ways to make one last comment!) For many years I had the long 12 letter last name of Sprengnether. It was a great way to tell if a phone call was from somebody who knew me as no telemarketer ever seemed to know how to pronounce it! Then there was the writing of such a long name when signing lots of papers. LoiS became a short personalized way to write it. Then I met "my Keel in life", Tom, the best husband I could ever have. I asked for advice on what to do with my name on Storytell, the international email list for storytellers now hosted by the National Storytelling Network. I wanted to recognize Tom, but didn't want to lose the fun of being "LoiS with the big S." At the same time, with 12 letters already, I didn't want to hyphenate it. Definitely no hyphenation I was told or I'd have to use it all the time, turning it into 16 letters + a hyphen would become my legal name. YUCK! Shades of the Hispanic female tradition of linking the "original name y new married name." Too long. The suggestion was made to just use that long name as my stage name. Yes, it might be a preservation of privacy, but that wasn't what I was seeking. Then it was suggested, why not use a very old traditional way where women often made their old name their new middle name? That way I could at times just be Lois Keel and at other times "LoiS with the big S."
O.k. I confess it lets me be a bit wicked at times when somebody's about to introduce me, asks me "How do you pronounce your last name?" and I smile and say, "Keel." 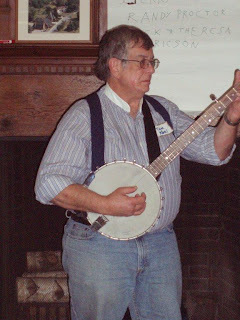 Of course Tom, who now is my "roadie" for many of my gigs -- especially ones where he gets to play a bit of banjo -- loves to accuse me of marrying him just for his short last name. Definitely not true. As I said, he's my Keel in life, my soulmate. Lois, I may not have married a man for his short name, but it didn't take me long to discover the fringe benefits! After signing hall passes for students with my 10-letter "Klingemann" for several years, it seemed like my new signature was finished before it started, especially when I began just putting "Ketc." on those hall passes nobody ever looks at anyway! Love that Ketc! I also remember that as the call letters for the PBS-TV station in St. Louis. It was the "educational t.v." station back then. So you were famous and didn't even know it!